Check out Tobi's May Morning Pullover It's all about the sleeves. This winter put on Free People's May Morning Natural Pullover. 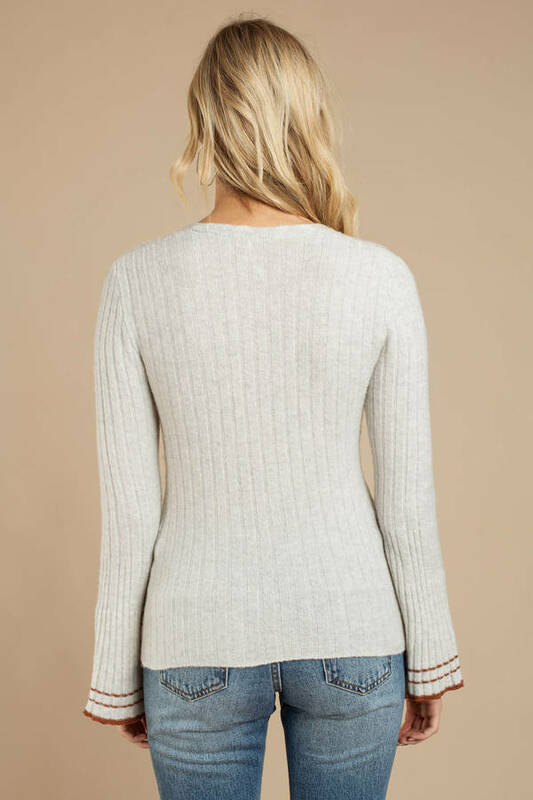 This belle sleeve sweater features a plunging v-neckline, flared sleeves striped at the hem, and ribbing throughout. Pair this flared sleeve top with tight high waisted pants and booties for a chic fall 'fit. It's all about the sleeves. This winter put on Free People's May Morning Natural Pullover. This belle sleeve sweater features a plunging v-neckline, flared sleeves striped at the hem, and ribbing throughout. Pair this flared sleeve top with tight high waisted pants and booties for a chic fall 'fit.